Tens of thousands of Palestinians are now living in a Lebanese ghetto called Ain Al-Hilweh, and the world seems to be fine with that. No one cares when an Arab country mistreats and discriminates and kills Palestinians. But when something happens in the West Bank or Gaza Strip, the international media and community suddenly wake up. Why? Because they do not want to miss an opportunity to condemn Israel. One can only imagine the uproar in the world were Israel to pass a law denying Arabs jobs or the right to inherit property. There are no protests on the streets of London or Paris. The UN Security Council has not — and will not — hold an emergency session to condemn Lebanon. Of course, the mainstream media in the West is not going to report about Arab apartheid and repressive measures against Palestinians. As for the leaders of the Palestinians in the West Bank and Gaza Strip, they do not have time to address the problems of the camp residents. The Palestinian Authority and Hamas are too busy fighting each other, and the last thing they have on their minds are the interests and well-being of their people. Lebanon is one of several Arab countries where Palestinians are subjected to discriminatory and apartheid laws and measures. The plight of Palestinians in Arab countries, however, is apparently of no interest to the international community, and pro-Palestinian activists and groups around the world. Recently, the Lebanese authorities placed electronic screening gates at all entrances to Ain Al-Hilweh, the largest Palestinian refugee camp in Lebanon. The move has sparked a wave of protests in Ain Al-Hilweh and among Palestinians living in other refugee camps in Lebanon, who are describing the installation of the electronic gates as collective punishment. Until a few years ago, Ain Al-Hilweh had a population of 75,000. However, with the influx of refugees from Syria, which began in 2011, the camp’s population is now estimated at more than 160,000. About two years ago, the Lebanese army began building a security fence around Ain Al-Hilweh as part of an effort to combat jihadi terror groups that were reported to have infiltrated the camp. With the completion of the fence, the Lebanese authorities, in a move that has surprised the Palestinians, decided to install electronic gates to screen all those entering and leaving the camp. The Lebanese authorities say the gates are critical to discovering explosives and other types of weapons. The installation of the electronic gates came during the holy month of Ramadan — a move that has further exacerbated tensions inside Ain Al-Hilweh and drawn strong condemnations from the camp residents and other Palestinians. Leaders of several Palestinian factions in Lebanon who held an emergency meeting earlier this week to discuss the installation of the electronic gates called on the Lebanese government to ease security restrictions on the camp residents. Some of the leaders claimed that the new gates were part of a US-led “conspiracy” targeting Palestinian refugee camps in Lebanon. “We fear that the recent Lebanese measures are in compliance with US pressure on the Lebanese government to impose punitive measures against the Palestinian camps [in Lebanon],” said a Palestinian official who attended the emergency meeting. He claimed that most of the terrorists wanted by the Lebanese authorities had left Ain Al-Hilweh in spite of the tough security measures surrounding the camp, and as such there was no justification for the electronic gates. In the past few days, residents of the camp have staged a number of protests against the electronic gates, and demanded an end to the Lebanese authorities’ harsh measures against Palestinians in Ain Al-Hilweh in particular and Lebanon in general. “We prefer to die than to be humiliated,” and “The people in the camp challenge the gates,” the protesters chanted. A Palestinian human rights organization condemned the Lebanese army’s decision to place electronic gates at the entrances to the camp. He said the measure turns all the residents of Ain Al-Hilweh into suspected terrorists. “This measure is an insult and humiliation to the camp residents and an assault on their dignity,” the organization said in a statement. On June 13, a delegation representing Palestinian factions met with Bahia Hariri, a Lebanese parliament member who happens to be the aunt of Lebanese Prime Minister Saad Hariri, and appealed to her to intervene to have the gates removed from the entrances to Ain Al-Hilweh. The delegation complained to her that the gates have had a negative impact on the lives of the camp residents and urged her to use her influence with the Lebanese authorities to ease restrictions imposed on Palestinians in Lebanon. Here it is worth noting that the 450,000 Palestinians in Lebanon have long been suffering from a policy of systematic discrimination and marginalization by the Lebanese authorities in all aspects. The residents of Ain Al-Hilweh now fear that the tough security measures around their camp, including the placement of the electronic gates, mean that they could meet the same fate. That is why they are planning to step up their protests in the coming days and weeks. However, the Palestinians in Lebanon would be mistaken to pin high hopes on the international community or Palestinian leaders. The international community pays attention to the Palestinians only when it is possible to blame Israel. The only Palestinians who seem to win the attention of the international community and media are those living in the West Bank and Gaza Strip and who are in direct conflict with Israel. Palestinians living in ghettos in the Arab world and who are being killed and displaced by Arab armies do not attract any attention from the international community or mainstream media. No one cares when an Arab country mistreats and discriminates and kills Palestinians. But when something happens in the West Bank or Gaza Strip, the international media and community suddenly wake up. Why? Because they do not want to miss an opportunity to condemn Israel. The residents of Ain Al-Hilweh would have been fortunate had Israel placed the electronic gates at the entrances to their camp. Then, dozens of foreign journalists and human rights activists would have converged on the camp to document an Israeli “violation of Palestinian human rights.” One can only imagine the uproar in the world were Israel to pass a law denying Arabs jobs or the right to inherit property. Tens of thousands of Palestinians are now living in a ghetto called Ain Al-Hilweh, and the world seems to be fine with that. 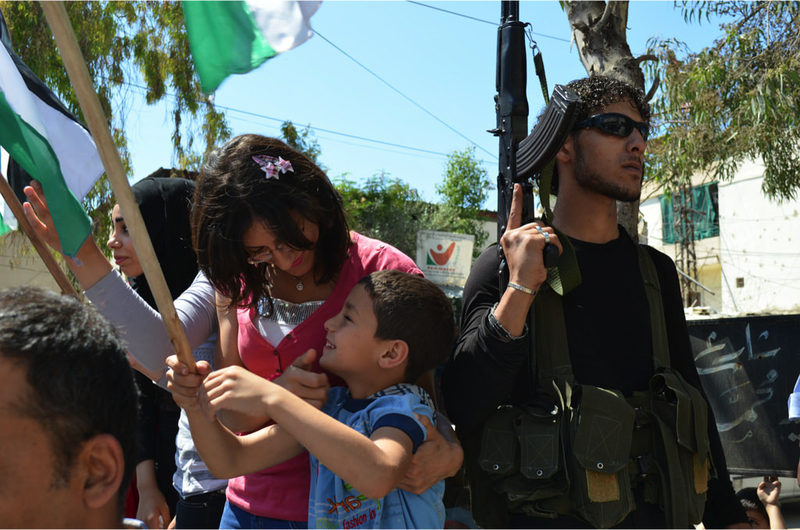 In fact, most Palestinians in Lebanon have long been living in ghettos surrounded by the Lebanese army. There are no protests on the streets of London or Paris. The UN Security Council has not — and will not — hold an emergency session to condemn Lebanon. Of course, the mainstream media in the West is not going to report about Arab apartheid and repressive measures against Palestinians. As for the leaders of the Palestinians in the West Bank and Gaza Strip, they do not have time to address the problems of the camp residents. The Palestinian Authority and Hamas are too busy fighting each other and the last thing they have on their minds are the interests and well-being of their people. Khaled Abu Toameh, a journalist based in Jerusalem, is a Distinguished Senior Fellow at Gatestone Institute. Previous Post ¿De verdad quieren volver a los sacrificios de animales?